No chimney installation is complete without a high-quality vent cap. 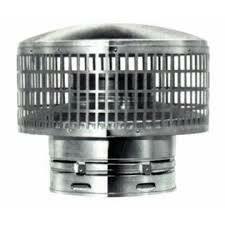 This Metal-Fab Type B Round Chimney Vent Cap will protect your round Metal-Fab Type B chimney system from rain and debris as well as help prevent backdrafts. And, because it features the same unique twist lock connection system as the rest of your chimney, attaching this vent cap couldn't be easier. will this stay on a 7 inch diameter b vent pipe that doesn't have the locking system?